Scorpio Taurus love compatibility in a romantic relationship will be very intense. However, that could be positive or negative. They are opposite signs in the zodiac. They will have a special and complex bond. They can be two halves of one whole. They both have strengths that will help to balance out each other’s weaknesses. The Scorpio Taurus soulmates will likely be very attracted to each other physically. The scorpion and the bull have a lot in common. They both have strong personalities. They could go back and forth between passionate love and passionate disagreement. The Scorpio zodiac sign is ruled by the planets Mars and Pluto. Taurus is ruled by the planet Venus. Mars is concerned with passion, Pluto is concerned with power, and Venus is concerned with love and money. This Scorpio Taurus relationship is very intense because of Pluto’s influence. However, it will be a very good balance of male and female energy. Scorpio and Taurus in love form the foundation of all romantic relationships. They bring love and passion together. Venus and Mars compatibility will work well together. Venus is concerned with the beauty of romance and Mars is concerned with the passion of romance. Scorpio is brooding and intense, and very passionate. The bull is a seductive and energetic partner. They are attracted to the scorpion’s intensity. Scorpio will admire the inherent loyalty in the Taurean. Scorpio is a Water sign. They are usually very deep and can be vindictive. If the scorpion feels they have been mistreated by the bull, they will lash out at the bull. They are both very devoted to each other. Taurus is an Earth sign. They are open and direct about what they are feeling. However, the Scorpio personality is more secretive and will hide their feelings. They will both be able to teach each other about their opposite views on life. They are both likely to be envious. This can add another interesting dimension to the Scorpio Taurus friendship. The bull will not mind when the scorpion expresses their envious feelings. The bull will realize it means they are adored and appreciated. Scorpio and Taurus are both Fixed signs. They will both be very stubborn and obstinate when they make their minds up. If their minds do not agree, they will have fights. Their fights are unlike anything they will have seen with other zodiac signs. Taurus might seem to win because they seem to be the domineering partner. However, this is not always true. The Scorpio men and Scorpio women will use more devious methods to win. They will use emotional manipulation to get what they want. They will both have to learn to talk about things openly and express their feelings. They will need to learn how to compromise with each other if they want to have a successful Scorpio Taurus compatibility. This will depend a lot on the scorpion learning they can trust the bull. The relationship will not be successful they are not able to overlook their opinionated and stubborn views. The Scorpio and Taurus compatibility in a romantic relationship is the powerful bond they have. Their connection will shine when they are able to overlook their differences. The scorpion will have to realize that the bull is there to stay. The bull is not going to add to the misery that some Scorpio seem to attract. Because of this, the relationship can develop nicely. The Scorpio and Taurus marriage will be dramatic, intense, and potent together. They are opposite of each other in the zodiac. Because of this, they might seem to work very well together. In practice, rather than in theory, they both have powerful personalities. They will be very attracted to each other, but these star signs might have issues the longer they are together. The Taurus personality is the lover of the zodiac. They are grounded, seductive, and romantic. The bull will be very open and honest with their feelings. Scorpio is the sorcerer of the zodiac. They are easily more than a match for Taureabn physically. Taurus will seem to win arguments through their force. The bull might manage to out maneuver the scorpion. However, Scorpio will be the one working behind the scenes. They will not mind resorting to clandestine manipulation, emotional blackmail, and even petty spite. The sorcerer is not an enemy most will want to have. However, Taurus can win Scorpio over. The bull will help the scorpion trust them and believe in them. Scorpio and Taurus compatibility will be held together by their physical chemistry. When Scorpio understands how much Taurus cares about them, the Scorpio star sign compatibility will grow deeper. Scorpio and Taurus in love both have deep desires. The scorpion will want power. The bull will want material things. They are both concerned about money and resources. They are both very passionate about many different things. The bull will be more focused on self. The scorpion will focus more on their partner and family. They will both find security in a relationship to be very important. However, they have somewhat different focuses. Taurus values honesty and trustworthy people. They will despise infidelity. At the same time, Scorpio born enjoys being mysterious. Their need for security will be based more on continually needing reassurance that their emotional connection with their partner is strong. However, the Taurus born will need this reassurance too. They will be more than willing to give the Scorpion the reassurance they need. In this Scorpio and Taurus compatibility, the scorpion will hide their emotions behind a mysterious mask. The bull in love will require trust and transparency. However, the scorpion will be inherently secretive. The sorcerer will not want their secrets and mysteries exposed for the world to see. They will always hold back some of their emotions and the bull will need to learn to accept that. The Scorpio and Taurus couple have to learn to overcome this difference. However, this might be the first of a lot of different issues they could have. Scorpio dating Taurus will definitely be attracted to each other. They can see a lot of highs or a lot of lows together. They are likely to see both. They will have a sexual relationship that is very physical in bed and very private. The bull likes open communication. However, they will not want to talk about their physical activities at home. Both the scorpion and the bull can be very clingy and envious. They have a powerful relationship that has the potential for destruction. Because of this, the scorpion and the bull might try to provoke envious feelings from each other. However, they only want to be reassured they are loved by their partner. This can be very heavy and not always healthy for the relationship. The scorpion and the bull are both fixed signs. Because of this, they will stubbornly hold on to their opinions. Neither Scorpio nor Taurus will want to give in or compromise. When they have fights on everyday issues, their fights can be legendary and scary. The scorpion and the bull will not be likely to say sorry but they will not be likely to forget a grudge either. This might end up in the Scorpio Taurus breakup. Scorpio and Taurus are water and earth signs. They can be beneficial to each other in small doses. The bull can help calm the scorpion’s emotions. The scorpion can help the bull move past logic and common sense. Scorpio will help Taurus move into another world of emotional possibilities. 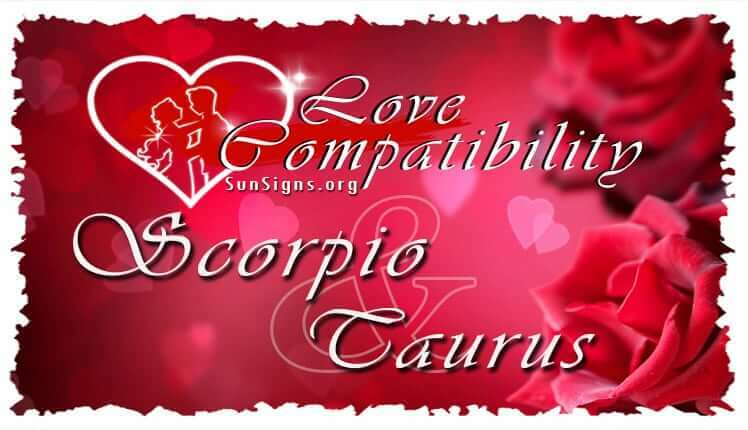 The love compatibility in this Scorpio Taurus relationship is complex. The positive side of this Taurus compatibility might get lost in the drama, passion, intensity and pain.